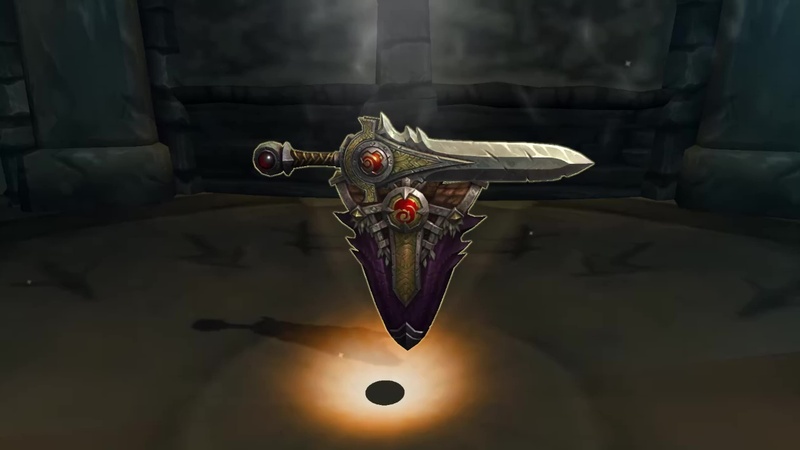 Odyn: The greatest warrior should wield the greatest weapons. Long ago a great king, Magnar Icebreaker, wielded weapons crafted from a scale of the mightiest dragon in the land. He should be here, but he is not. Instead he languishes in his tomb. His son, Hruthnir, is here. He will lead you to the tomb. If Magnar can be saved, do so. Either way, return with his weapons. 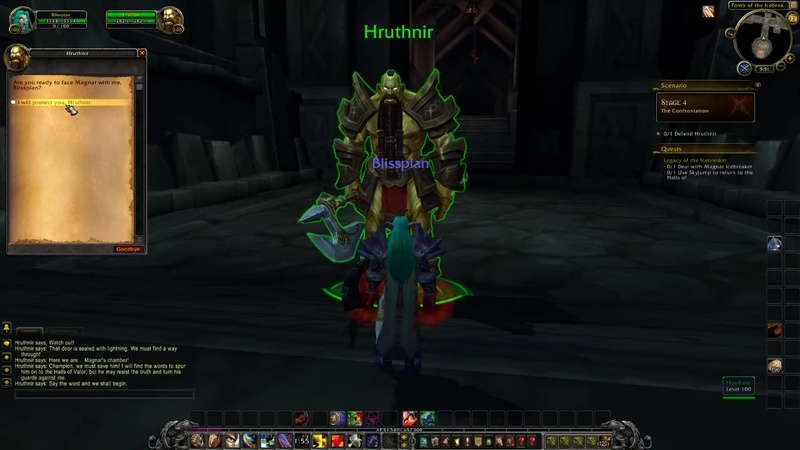 Hruthnir: Odyn believes you are worthy to wield the Armaments of the Black Wyrm. I am here for Magnar Icebreaker. Let us both be successful, eh? 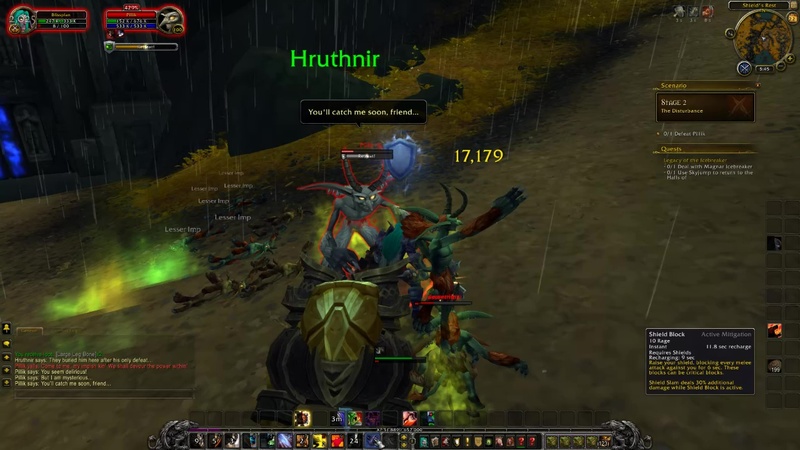 Hruthnir: Our Journey should be quick. Odyn is lending his might to pierce the veil of Helya’s sorcery. 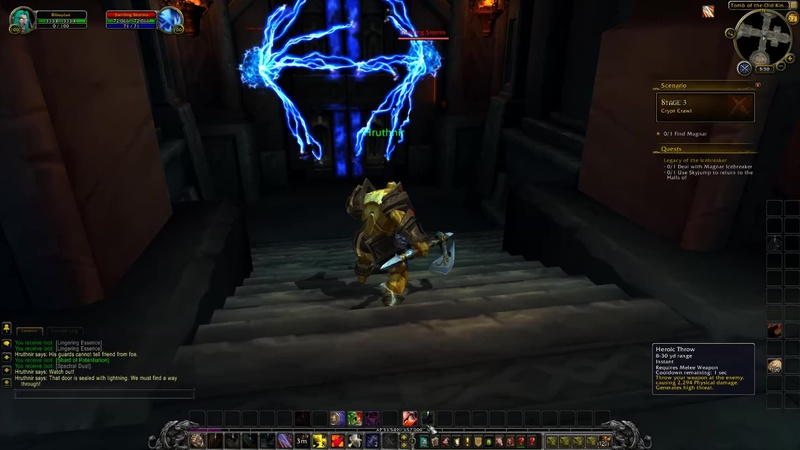 STAGE 1: The Sealed Tomb — Find Magnar’s Tomb with Hruthnir. Pillik: Come to me, my impish kin! We shall devour the power within! STAGE 2: The Disturbance — Defeat the Legion forces. Pillik: You seem delirious! But I am mysterious… You’ll catch me soon, friend… Why… so serious…? Hruthnir: A good fight! Follow me. I will open the tomb. STAGE 3: Crypt Crawl — Find Magnar’s resting place within the tomb. Hruthnir: The guardians do not obey me! Seems we will have to do this the hard way. NOTE: In this first room of the Tomb of the Old King, there are 6 Swirling Storms — electrical orbs that chase you. They emit an AOE pulse every second — about 15K damage each pulse. Seems to be a Protective Warrior test. You can use Heroic Throw to hit them from afar. That disables them for a few seconds while you fight Reylar the Stormcaller. Optionally, let Hruthnir kill him from a safe distance. Hruthnir: These spirit winds are relentless! We cannot walk through. NOTE: In this hallway, use Leaping Giants and land behind the Spectral Windshaper to prevent getting pushed by the wind. 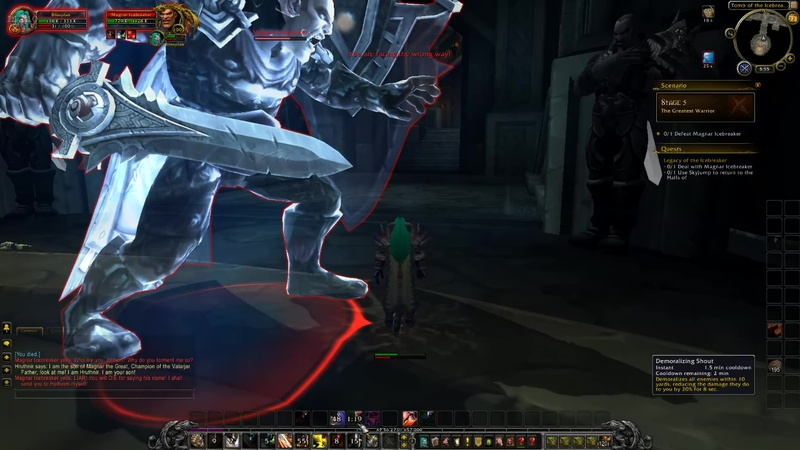 Kill the Spectral Windshaper. It won’t fight back. Use Leaping Giants again on the second Spectral Windshaper. The wind will stop, and you may continue deep into the tomb. Hruthnir: His guards cannot tell friend from foe. Watch out! That door is sealed with lightning. We must find a way through! 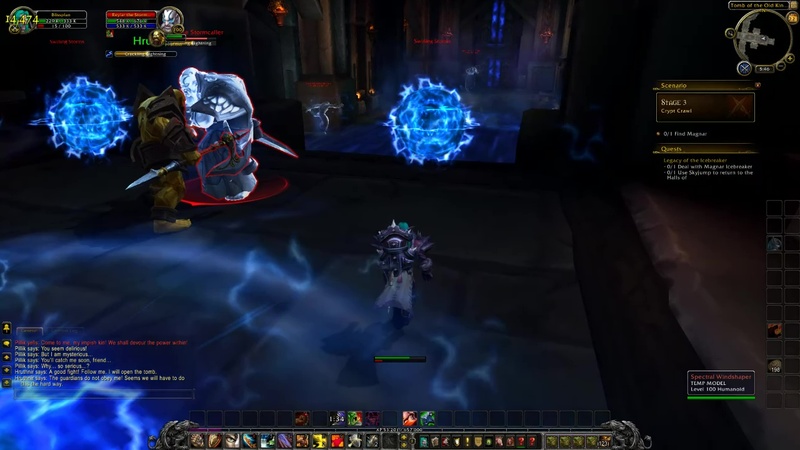 NOTE: Click the electrical orbs and cast Heroic Throw to disable them. The door will open. STAGE 4: The Confrontation — Defend Hruthnir from Magnar’s forces. Hruthnir: Here we are… Magnar’s chamber! Hruthnir: Champion, we must save him! I will find the words to spur him on to the Halls of Valor, but he may resist the truth and turn his guards against me. Say the word and we shall begin. Are you ready to face Magnar with me, (name)? Magnar Icebreaker: You are not my son! 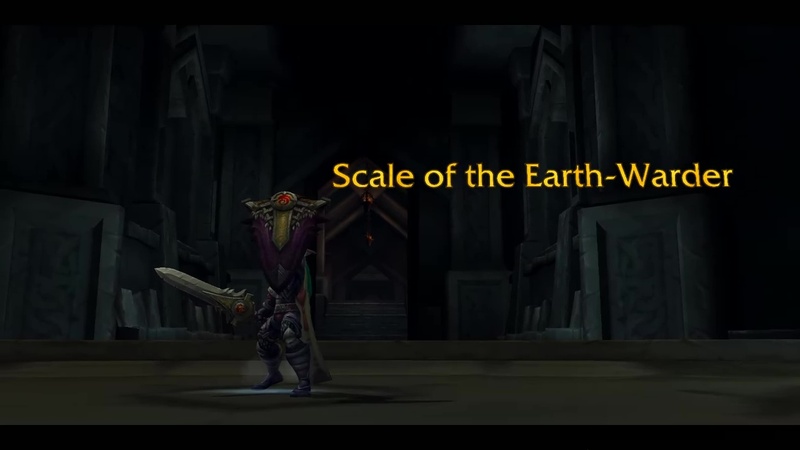 He is in the Halls of Valor, called by Odyn before his time! Begone from here, trespassers! Hruthnir: It IS me. I fell before you in the battle of the Pass. We were betrayed! Hruthnir: I fell in battle. We ALL fell. None survived the onslaught. Not even you! Magnar Icebreaker: What lies! 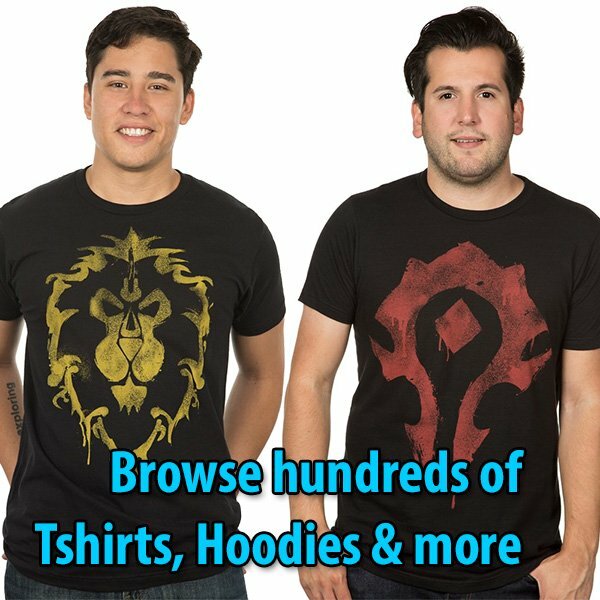 Can you not see my army? Hruthnir: You died in glorious battle! The Halls of Valor await. Come with me, father! Magnar Icebreaker: ENOUGH OF THIS! Guards, punish these outsiders for their insolence! 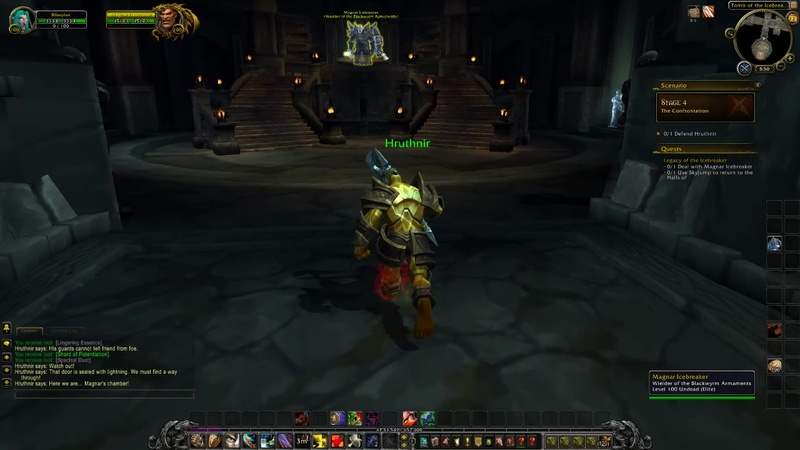 NOTE: I don’t know how to play a Warrior Tank, its rotations and mitigation mechanics — but it was kinda rough. Waves of vrykul keep coming at you. 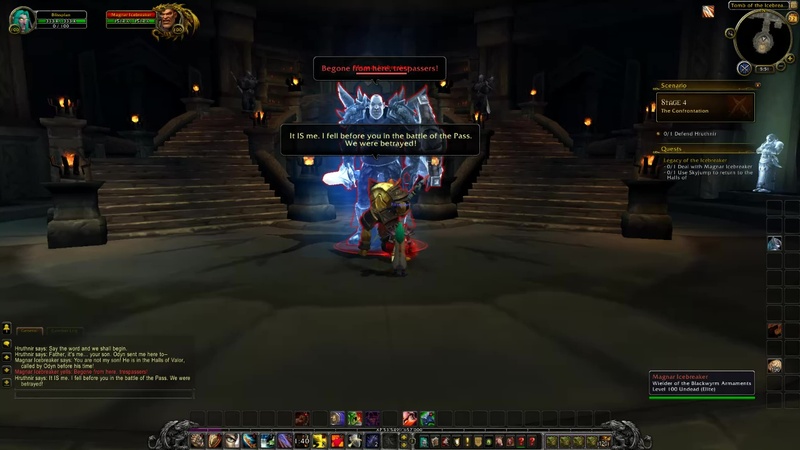 Probably 10-12 vrykul over a minute lapse. Might be a good idea to move toward the entrance so that each of them take a while walking toward you so you can dispatch them in intervals. Let Hruthnir handle some for you. He won’t die in this encounter even at 1 health. Magnar Icebreaker: Who are you, demon? Why do you torment me so? Hruthnir: I am the son of Magnar the Great, Champion of the Valarjar, Father, look at me! I am Hruthnir. I am your son! Magnar Icebreaker: LIAR! You will DIE for saying his name! I shall send you to Helheim myself! NOTE: This encounter can be rough. 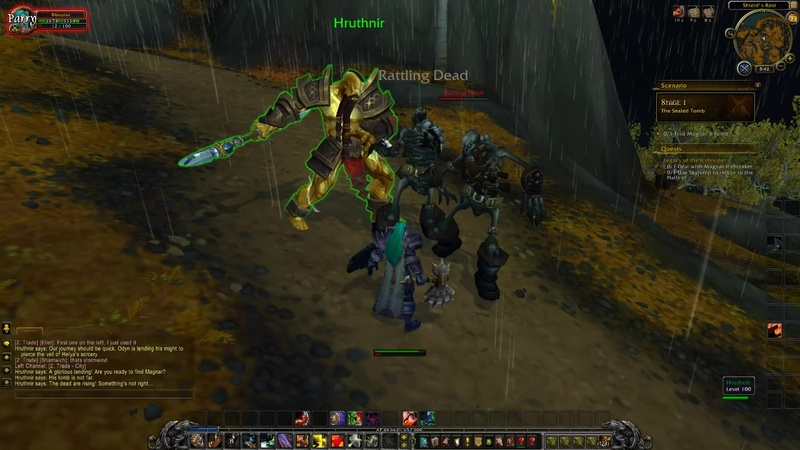 In fact, of all the artifact questlines I played, this was the only one where I died twice. Again, likely for lack of knowing the mitigation system and rotation. 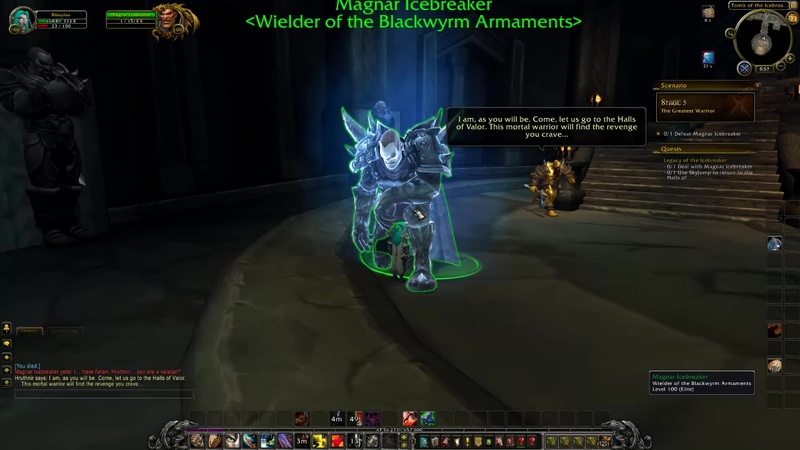 Magnar Icebreaker casts Bladestorm — which does up to 25K damage per hit. He also channels Penta-Strike which looks like a red “X” effect. It is probably a stance. Does between 24-26K damage per hit. If you walk away a few yards, he will charge dealing 15K physical. Magnar Icebreaker: I… have fallen,. Hruthnir… you are a valarjar? Magnar Icebreaker: I see now. My weapons are yours, warrior. May they bring you glory as you strike down Helya’s minions! FINAL STAGE: Armaments of the Black Wyrm — The sword and shield are yours, claim them. Hruthnir: His weapons are yours now, champion. There is nothing left for us here. 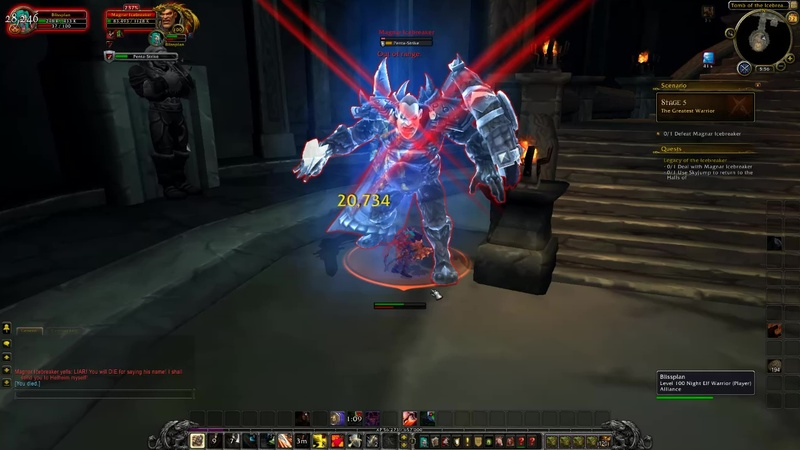 Summon the val’kyr and let us return to the Halls of Valor. 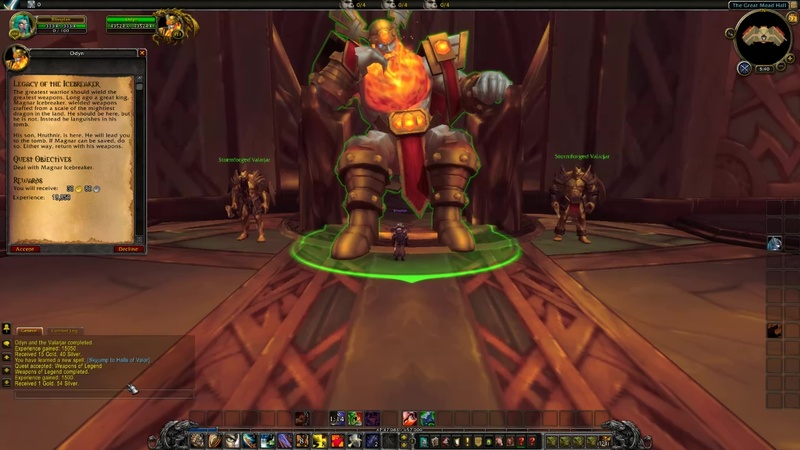 NOTE: Click the new spell Skyjump to Halls of Valor and turn in at Odyn. Odyn: A great deed was done today. I have gained a mighty warrior, and you a powerful artifact.